Aries Gold Ceramic Watch – this baby is mine! I am very grateful to be given the chance to review this gorgeous Aries Gold Ceramic Watch. I fell in love with it the moment our eyes met. 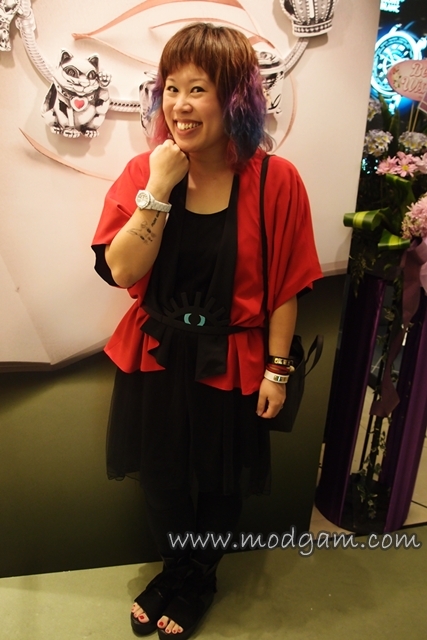 With my colorful outfits, this white gorgeous will help bring out my overall style. I LOVE my accessories and having a good watch that you are able to match with most outfits is the best accessory. High-tech ceramic is used in watchmaking for producing watch cases. 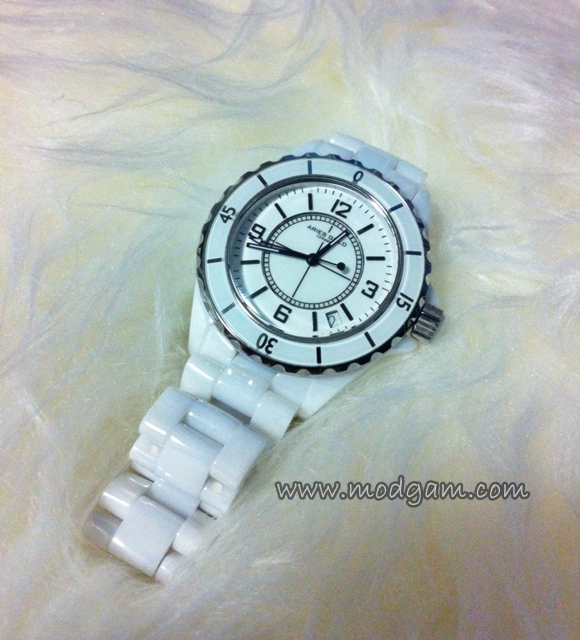 The material is valued by watchmakers for its light weight, scratch resistance, durability and smooth touch. You will be seeing a lot of this beauty in my outfit of the day for its so easy to match! The innovation of Aries Gold started in 1962 where the company first began manufacturing handmade clocks, combining traditional craftsmanship and a passion for innovation. After many months of conceptualisation, with a strong foundation in engineering and manufacturing horological instruments, Aries Gold went on to manufacture its first wrist watch in 1970. The brand was also officially registered in that year. As wristwatches grew in demand, the manufacturing of wristwatches slowly took over the place of clocks. Since 1970, Aries Gold have been focusing on designing premium sports watches that are a representation in Inspirations, exhibiting professional watch-making quality, innovation and style. To achieve a breakthrough in innovation, Aries Gold expanded its movement manufacturing from Switzerland to both Switzerland and Japan. By working with co-engineers in Switzerland and Japan, Aries Gold’s team of experienced watch-makers took another bold step to challenge the watch-making feats in the three segments of extreme sports, Racing, Diving and Flying. 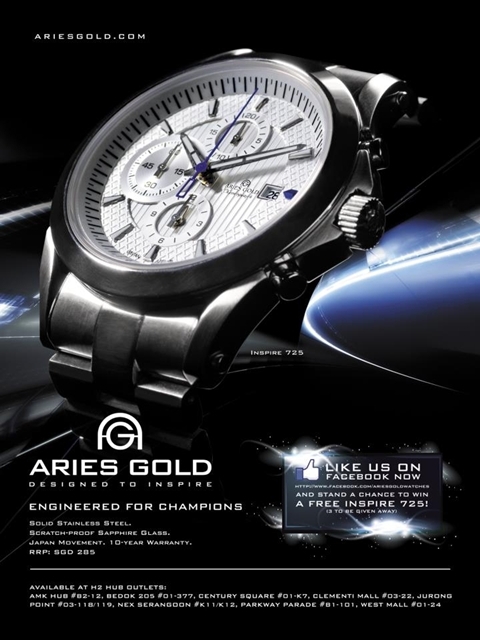 Aries Gold aims to create time-pieces that are the hallmark of precision, strength and avant-garde design. Nearing the end of 2011, Aries developed its first split-second chronograph, the Aries Gold Inspire Rally 723 (Precision) which measure up to 1/20 of a second. 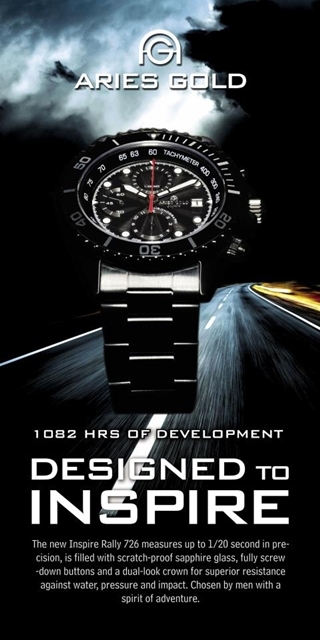 In 2012, Aries Gold made a new mission statement, ‘Using the passion of watch-making and the desire for perfection to Inspire the world, creating timepieces that are the presentations of Inspiration.’ Combining the traditional values of the brand the new technological partnerships, the ‘Designed To Inspire’ campaign was born. As of 2012, Aries Gold has been registered in 42 different countries, including Europe, US, Brazil, Australia, Japan, Korea, Switzerland, Thailand, India, UAE and Singapore. The brand is bring actively distributed in the US, Hong Kong, China, Malaysia, Indonesia and Singapore . The new vision will see the brand create more geographical footprint in its revitalised new ambition. I fall in love with this too..when I first saw it in your wrist! ahhahaha..nice watch! Oh it’s beautiful! 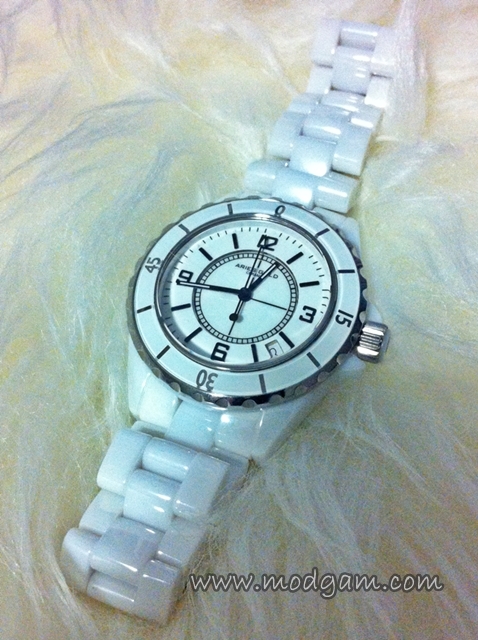 I love vintage ceramic jewellery (don’t come across many modern pieces) but I’ve never seen a ceramic watch – it’s awesome!